There comes a time in the life of every web site when a re-design is in order. This can be driven by a new brand image, making better use of advancing web technologies or simply the need to provide a better organizational structure. 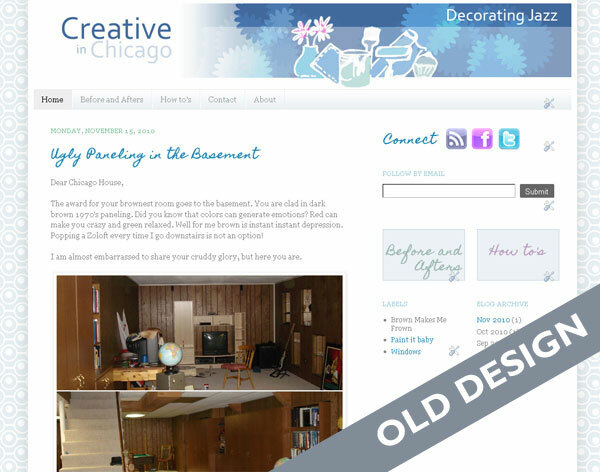 Needing to re-organize was the driving force behind a design shake up of Creative in Chicago, a craft and home decor blog and the outlet for my personal creative endeavors. When I first started this blog I opted for a quick and easy Blogger template, simply adding a custom header and working with the template designer to add a unique background and set the blog layout. It was fully functional but not the most appealing site in the world, but as I had no idea if it was something I was going to write on a regular basis, I didn’t want to invest a load of time in setting it up. As it turns out the blog now has over 200 posts with over 30K visitor a month and was in dire need of a shake up, so it underwent a redesign . For regular blogging I generally recommend using WordPress but because I did not want to spend more time than necessary, I decided to stick with Blogger. The overall look and feel of the blog was very bland and I wanted to punch it up a notch but still let the content of the site do most of the talking. The posts in the blog had all been categorized but I wanted to refine the categorization process and then use it as a navigational structure, making posts and topics of interest much easier to find. To enable visitor to quickly scan new content from the home page or a category page I wanted to move from the full post to a summary post format. The site receives around 30K visitors a month and I wanted to explore the advertising opportunities available for generate revenue from the site. Around 20% of the traffic comes via mobile devices so it was important that I provided a site that was optimized for those visitors. In re-designing a site I wanted to keep some semblance of the original site so not to completely alienate my readers with something totally new and unexpected. 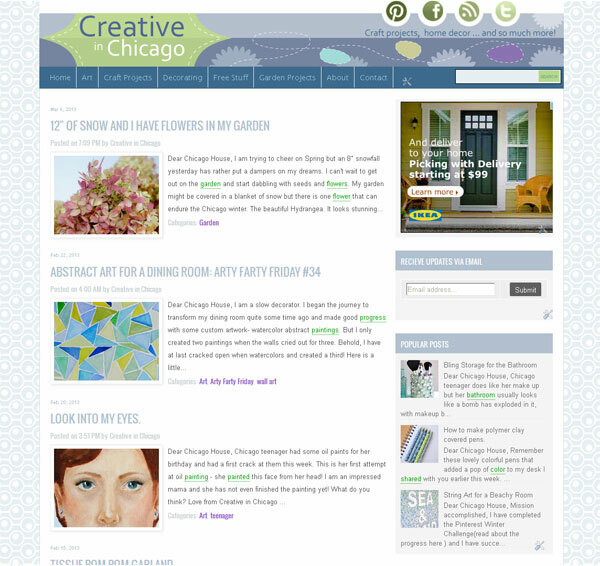 I kept the background patterns and type face of “Creative in Chicago” the same but completely reworked the header, creating a little more pop with the use of color and simple design elements and also integrated social media icons and RSS feed subscription. I also moved away from the full post format on the home and category pages. Instead the reader is now offered a summary of each post with an thumbnail picture. It is much easier to see at a glance the content of the site. Although I had been using categories to define content there lacked a definite structure which I could use as navigational tool. 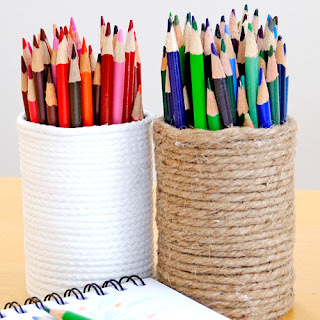 I reassessed and ended up with five main categories : Art – Crafts projects – Decorating – Free Stuff – Garden projects and within these categories I defined a number of sub categories. For example the category Decorating has five sub categories: Before and Afters – Painting – Decorative Accents – Wall Art Ideas- Windows . The navigation bar was reworked to include these main blog categories, with drop down elements for the subcategories. A search bar was also prominently placed. Posts that were buried deep within the blog are now much more accessible. I decided to incorporate Google Adsense into the site and allotted a spot high on the sidebar for placement. I wanted a position that would work both well for click throughs but not to be too invasive for my readers. 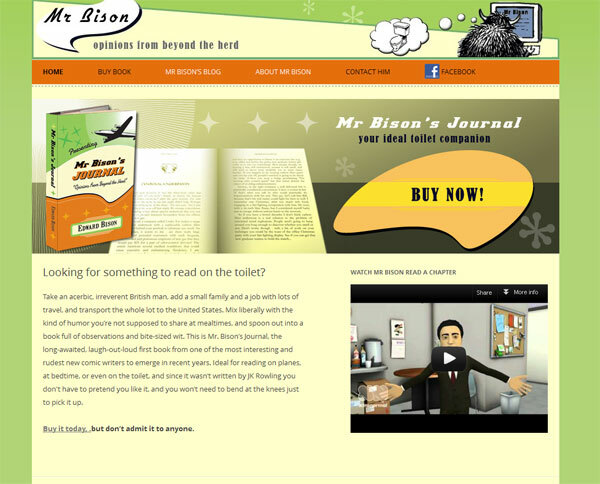 I am also experimenting with in-line advertising through infolink. Both are working nicely! Fortunately Blogger makes this really easy and it is as simple as selecting a pre-made template to display when anyone accesses the site with a mobile device. 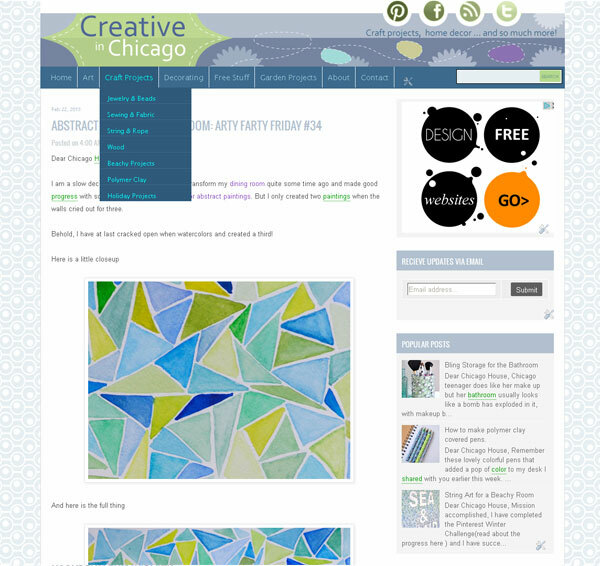 Looking for a Chicago web design company? A quick Google search for “Chicago web design company” producing a whopping 68,700,000 results. This is a big town and there are lots of players. Not every design firm will be right for every project and finding a company you are comfortable working with and a good fit for your project, can be a challenge. Website coding – need a design turned into a working website? We are located in Lincolnshire, in the North Shore area of Chicago. WordPress may be the preferred blogging platform for many but Google Blogger is still hugely popular. Over the years the administrative dashboard has changed very little but yesterday a much needed and completely new design to the dashboard for Blogger Draft was implemented . The overall appearance is a very clean and sleek design with a lot of the clunkiness of the old dashboard gone. A top navigation has been replaced by a left hand side drop down tool with intuitive little icons and a simple color palette is easy on the eye. As with any new release it will take a bit of getting used to, especially as I have been using the old interface for over six years. From what I have seen so far I like the direction Google has taken in this redesign. iChicagoWebDesigner.com. We have a new blog! Inspired by my original “Eye of the St Louis web designer” and now Eye of the Chicago web designer” series I have decided to launch an additional blog dedicated to my “Eye of the Chicago web designer” posts. Chicago is a rich city full of inspiration for us web designers … my camera has hardly stopped clicking since I arrived here! I didn’t want to swamp this blog with my photos. So without further ado click iChicagoWebDesigner.com and take a peak.